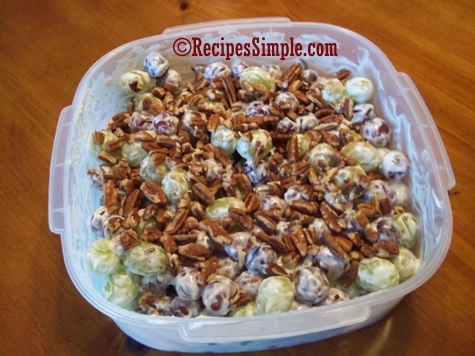 Creamy grape salad may be called a salad but I serve it as a delicious dessert! This cold and creamy dish is perfect and refreshing for those long hot summer days! Wash and remove any stems from grapes. Dry well and set aside. Beat the cream cheese, sour cream, sugar and vanilla in a large bowl until blended. Add the grapes and toss to coat. Cover and refrigerate (at least 2 hours) until ready to serve. Sprinkle with brown sugar and pecans just before serving.